A large deep upper trough remains centered over central Europe while several embedded vorticity maxima rotating around its center. On the trough’s western flank, a very cold/deep mid-levels spreading south from North Sea towards NW Mediterranean, while a surface low over N Sea gradually weakening while moving into France. A new surface low forms in the lee of the Alps over N Italy. A new potent trough with rapid cyclogenesis takes place N of Iceland. A MDT risk has been issued for Montenegro and W Albania with threat for torrential excessive rain, severe winds and some tornado and hail threat. Locally very high rain amounts are possible. A MDT risk has been issued for S Greece and W Crete into S Mediterranean with threat for tornadoes, severe winds, torrential excessive rain and large hail as a strong DCVA crosses the southern Mediterranean during afternoon and night hours. A SLGT+ risk has been issued for parts of N Italy with threat for excessive rain. It seems that again the highest amounts of rain are likely along the southern Alpine flank in NE Italy. A SLGT risk has been issued for surrounding the MDT/SLGT+ risk areas with threat for excessive rain, strong to severe winds and some tornado / waterspout and marginal hail threat. 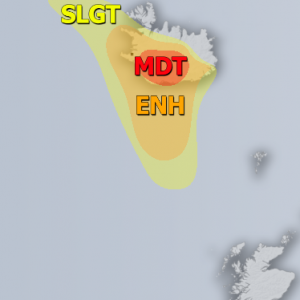 A SLGT risk has been issued for parts of Iceland and areas further NNE with threat for severe non-convective winds. 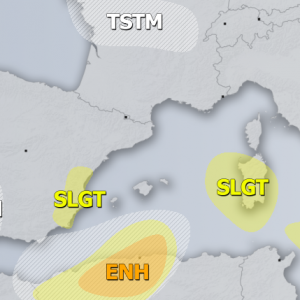 A SLGT risk has been issued for Pyrenees with threat for excessive rainfall as strong N flow leads into orographic precipitation into the mountains. A WNTR risk has been issued for higher elevations of Pyrenees and southern Alps with threat for excessive snowfall. Hurricane Michael now officially upgraded to Category 5! Persistent rainfall for parts of SE Spain in the next 48-72 hours!